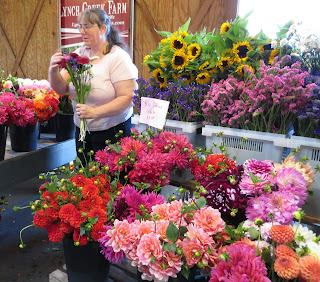 Beautiful flowers, incredible splashes of color: that's the formula for the beautiful Lynch Creek Farm dahlia booth at the Olympia Farmers Market. The fresh-cut dahlias at the market come straight from the dahlia fields at the Farm. Dahlia bouquets made up in vivid colors with elegant additions of sunflowers, salal leaves, beargrass strands, and statice ask nothing more than to go straight into a vase at home. 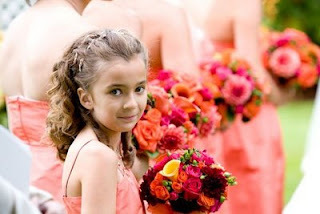 Prefer to make up your own bouquet? 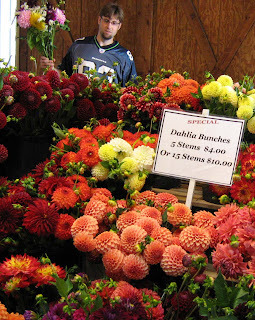 You can mix and match five-stem bunches or single stems; the possibilities are endless. You can even make up a wedding bouquet with dahlias! 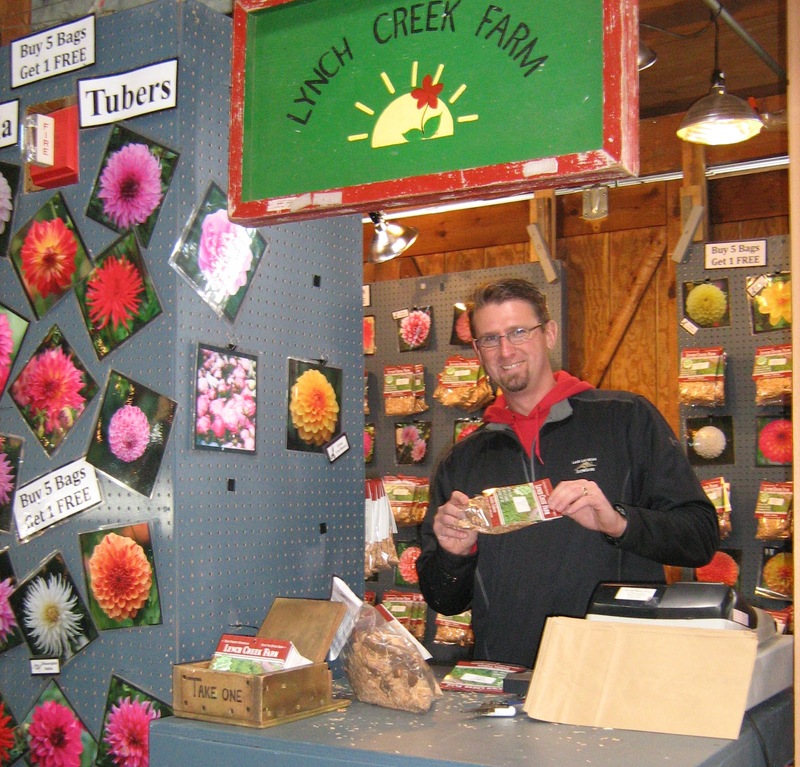 Lynch Creek Farm goes back a long way at the market: back more than 30 years, in fact, to the time when Farm owner Andy Hunter was a grade-school kid. His parents, Len and Colleen, decided that raising vegetables and flowers and selling them was a good job for three lively boys. the cut flower season at the market. All through his school years and college years, Andy spent summers and holidays working on the farm. And after a brief post-university venture into the corporate restaurant world, Andy decided that he'd rather grow things. He's grown a substantial business. 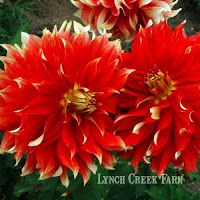 Dahlias, gorgeous as they are, make up just part of the picture that is Lynch Creek Farm today. 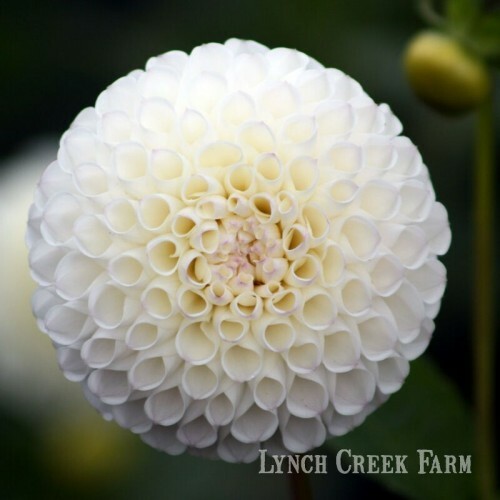 This fall, as soon as this season's dahlia tubers are dug and stored for the winter, the crew at Lynch Creek Farm will roll into action, making and shipping beautifully crafted holiday wreaths, swags, garland and centerpieces. Like Lynch Creek's dahlia tubers, the wreaths and greenery from the Farm go nationwide. And the wreaths and greens will go on sale at the Olympia Farmers' Market too. Look for them in the same south-wall location as Lynch Creek Farm's dahlia tubers and those beautiful bouquets of fresh-cut dahlia blooms. Dahlia plants are up and flourishing at Lynch Creek Farm. 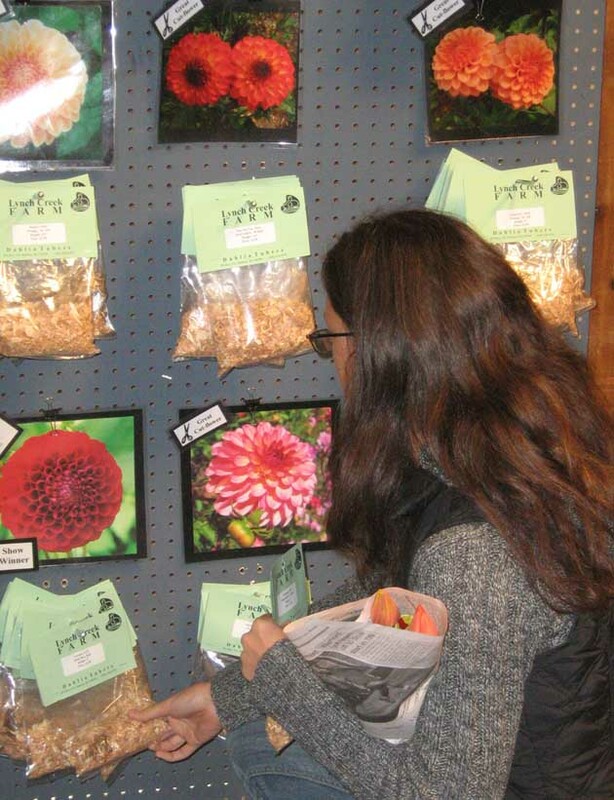 It's an interesting dahlia-growing season in South Puget Sound this year. Lynch Creek Farm's dahlia tubers went in right on time (right on time for a cool spring, that is) in late May, and a month later, the plants are up and growing. The sturdy and lush, shouldering up in their tidy rows, benefiting from moderate temperatures and frequent showers and lots of attention from the crew. off with early blooms. Photo by Evé. Given their planting date, the gang at Lynch Creek would expect the earliest blooms to open about a month from now, early in the fourth week of July. Strangely enough, on some of the dahlia varieties growing at the Farm, the first blooms have already appeared. That's something of an anomaly. Ordinarily, dahlia flower buds don't form until the plants are well formed and approaching their normal height. 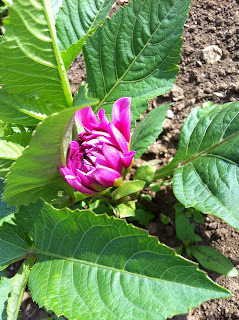 But this year, some buds are opening on plants a foot or so high. Maybe it's the moon, or some combination of temperature and light. Whatever the case, the plants are looking great and flourishing. And this little late-June preview of the blooming season, while it's strange, is a delightful harbinger of beautiful dahlia flowers to come. Snails think dahlias make a lovely lunch. 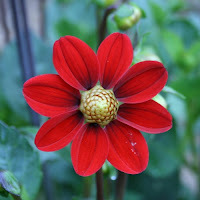 Once again, with newly planted dahlias just up or due to emerge from the ground, it's time to find ways to combat those kings of the dahlia pests, hungry slugs and snails. With a reservoir nearby and ivy all along one property border, our garden's a sitting duck for these wretched mollusks. Last year, I had good luck planting my dahlias in pots and topping them up with a good, thick layer of coarsely crushed eggshells. Sad to say, a gardening buddy took note and, as I do, saved eggshells all winter to protect his garden against snails and slugs. He set out a nice row of cabbages and covered the ground around it with a hefty layer of eggshells. The next morning, he went out to gaze proudly at his garden and found that all but three of his cabbages had been reduced to stubs. Eggshell topping kept this pot of dahlias slug-free. The problem, he realized, was that he'd prepared the ground for planting with a nice compost mulch. The slugs had probably been snoozing in the mulch, just waiting for him to infuse the area with breakfast. 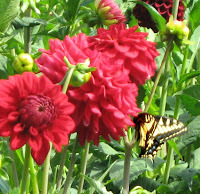 The job when you're growing dahlias, then, is to try to make sure that your composted soil and mulch are slug-free at planting time: no easy task, since even if you eliminate any slugs from the composter, there's a likelihood that there can be eggs that will hatch later and produce tiny, but voracious, junior slugs and snails. One inventive gardener we know puts tubs of his compost into the barbecue and heats them to kill any lurking slugs, snails or eggs. It works well, but don't try using the oven; the smell is appalling. 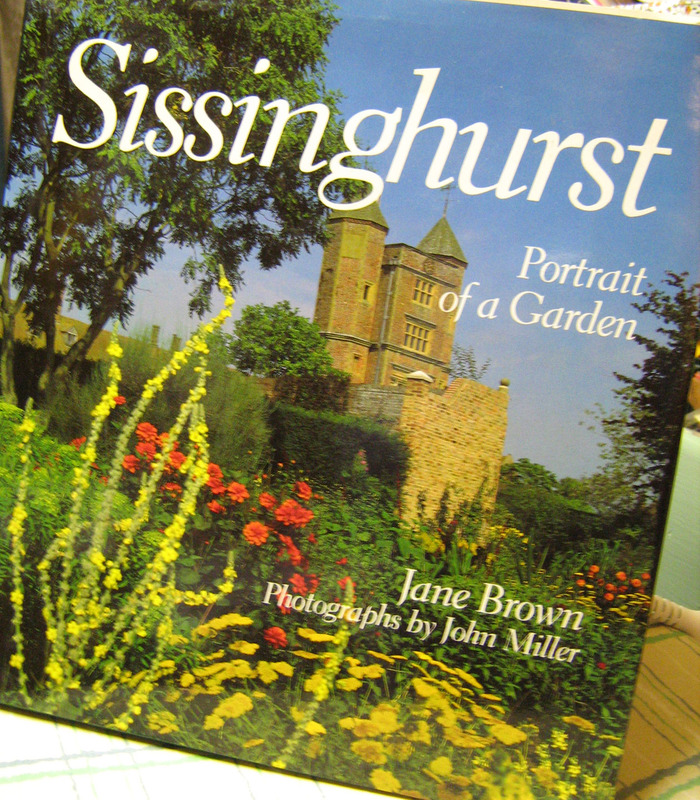 (My mother once tried that to sterilize potting soil for her petunias.) It's also pretty labor-intensive for a large garden area. 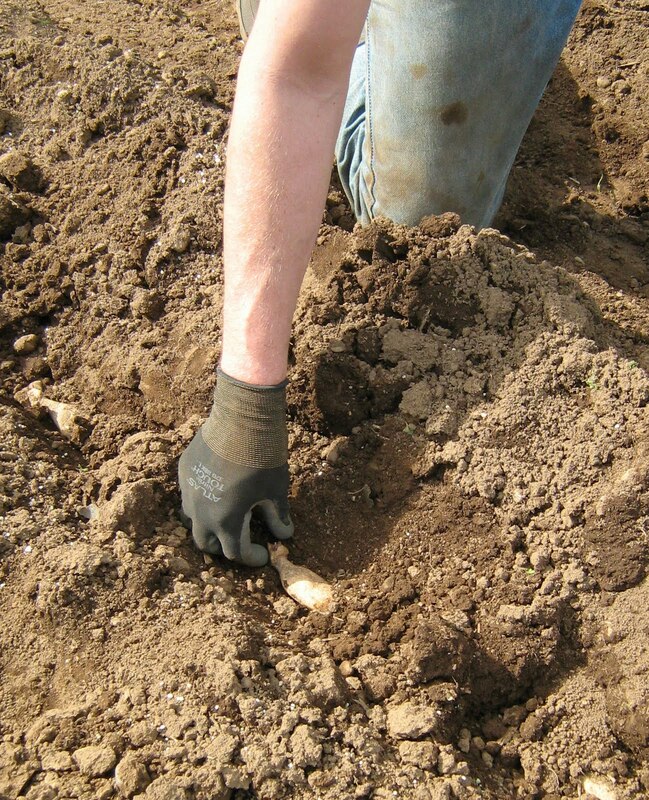 Your best bet is to plant in rich soil but wait to add mulch until your dahlia plants have gained at least half their height and their stems have begun to harden off. Avoid over-watering. 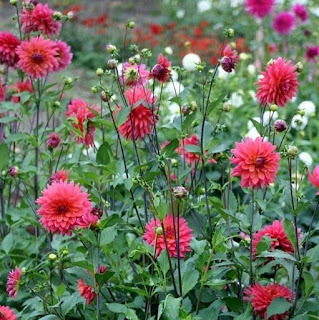 And a barrier of eggshells around your dahlias, and especially between their bed and any ground covers or other haven for slugs and snails will help too. Lynch Creek has replaced with energy-efficient ones. 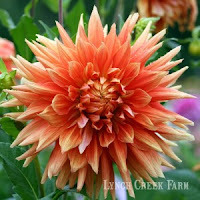 The days are brighter at Lynch Creek Farm's headquarters, where the crew is busy shipping out spring orders of dahlia tubers in anticipation of flower-y gardens across the country this summer. 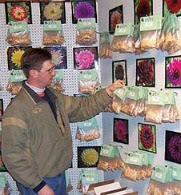 But the lengthening of spring days isn't all that's brightening the workplace at Dahlia Tuber Central. Even before the dahlia plants emerge from the fields at the Farm, Lynch Creek's gone green: a lighting refit in conjunction with the local public utility, Mason County PUD 3. New high-performance, energy-efficient lighting is in place in storage, workspace and office areas of the Farm's facility at the Port of Shelton. The better lighting, notes Lynch Creek owner Andy Hunter, is better and more energy-efficient in the storage area where the Farm's dahlia tubers spend the winter, and in the work area where the delicate operation of separating new tubers from the summer's root mass is performed. 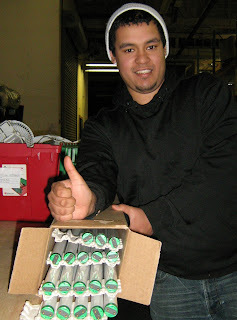 Evé Munguia, who prepares the individual tubers for storage and ultimately for market, says good lighting is essential for ensuring that every tuber has an eye, and helps assure better quality control in winter storage so the tubers emerge in the best possible condition in the spring. 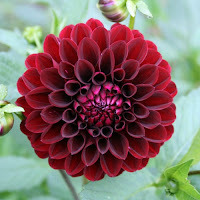 effective dividing of dahlia tubers. Benefiting from the refit are work, shipping and storage areas for the Farm's other business, holiday wreaths, greens and centerpieces. 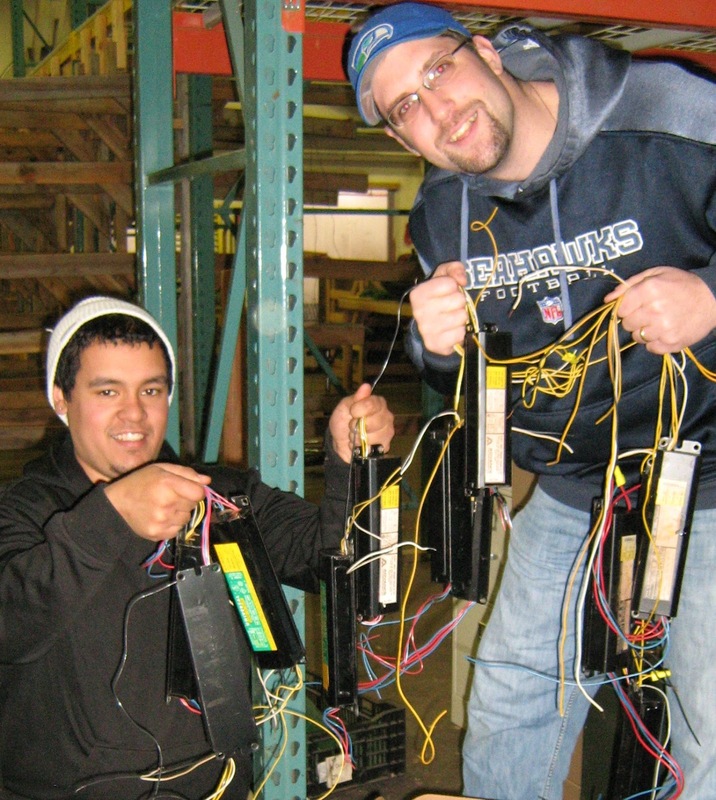 New lighting is also in place in the administrative area where orders are received and processed. As Lynch Creek Farm's power use becomes more efficient, the Farm's customers benefit from that efficiency with savings as well. Electric lighting, according to PUD 3 of Mason County, accounts for almost 40 percent of the energy consumed in U.S. commercial buildings each year. Changing to T8 fluorescent lighting can reduce energy consumption by up to 50 percent, and the utility provided cost-effective incentives for making the change. The utility says that T8 lighting is better and safer. As a family-style operation, a safe workplace is important to Lynch Creek Farm — just as important as great wreaths and beautiful, beautiful dahlias. Labels: dahlia tubers, energy-efficient lighting, green business practice. Well, maybe not all of them. But lots of the weeds that invade your dahlia garden might just as well invade your salad bowl or your soup pot. After the dandelions have bloomed for a while, their leaves toughen and exude a white sap when cut. At that point, they're more bitter, but they still add lots of nutrients and flavor to soups. We like to use them, along with green-onion tops or chives, sage, rosemary, and thyme, to stuffing for poultry, or simply fill the cavity in a roasting chicken with them. And of course, dandelion blossoms make a simply splendid wine. One note of warning: don't use dandelions from your lawn in cookery unless your lawn-tending practices are strictly organic. 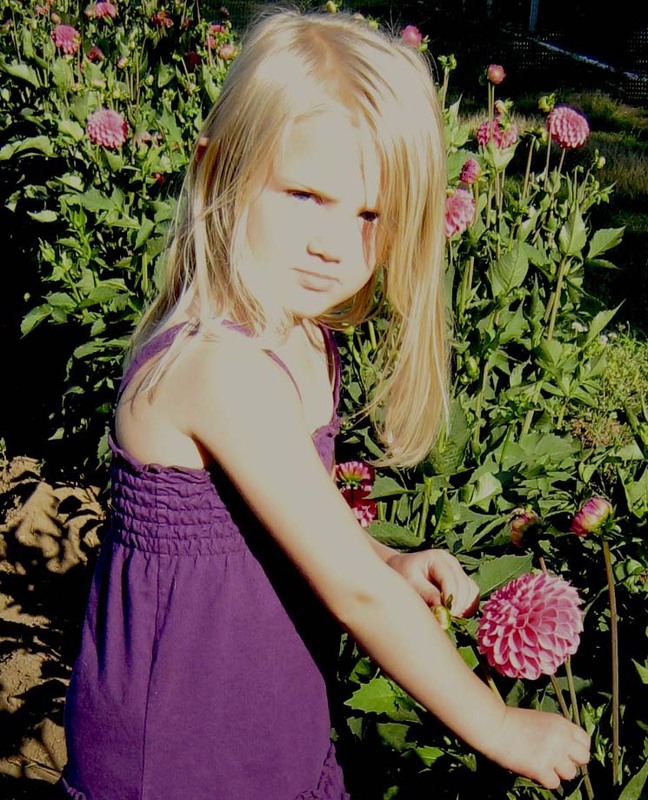 Systemic pesticides, even if the dandelions survive, aren't good for your own insides. 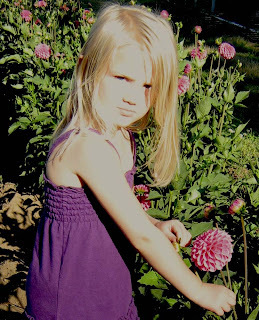 But the dandelions that invade the beds you've prepared for your dahlia tubers — those are the ones to devour! for any cream soup, hot or cold. Another spring garden invader is garden cress, a round mound of bright green compound leaves with a central flower stem that goes from blossom to ripe seed faster than it seems possible. 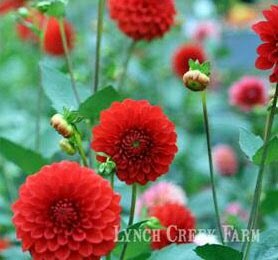 In a well-fertilized garden, such as you've likely prepared for growing beautiful dahlias, these produce beautiful, thriving rosettes of leaves with a spicy zing like that of watercress or pricey arugula. They make another fine addition to salads and a great garnish for soups or casseroles. Later in the season, the crew at Lynch Creek Farm will find another invader in the fields: lambs-quarter. That succulent herb also has its culinary uses; we'll be back with photos and a recipe when it starts to appear. 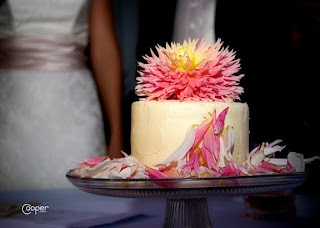 Dahlias decorate a wedding cake. 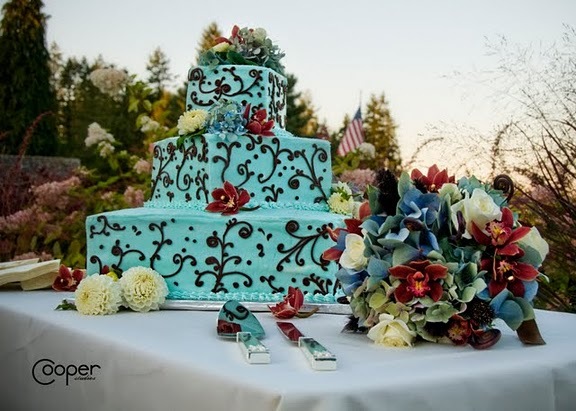 Photo by Cooper Studios in Shelton, Washington. 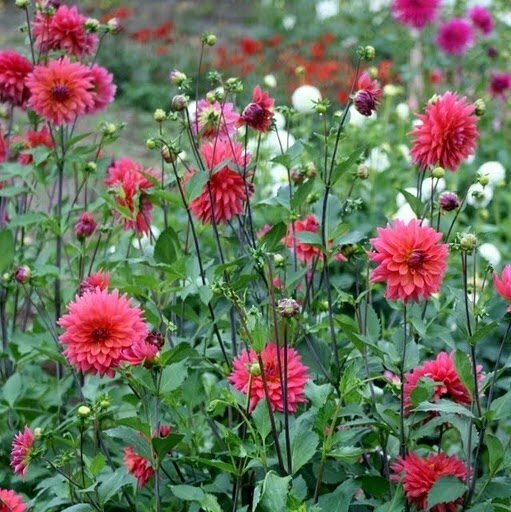 Early botanists who regarded dahlias as vegetables weren't as far off base as it might seem to gardeners today, who value the plants for gorgeous dahlia flowers. Historians say the ancient Aztecs used dahlia flowers to treat epilepsy, and manuscripts found in Mexico also recorded other medicinal uses for the plant: a preparation of dahlia stems was used to treat urinary-tract disorders, for instance. 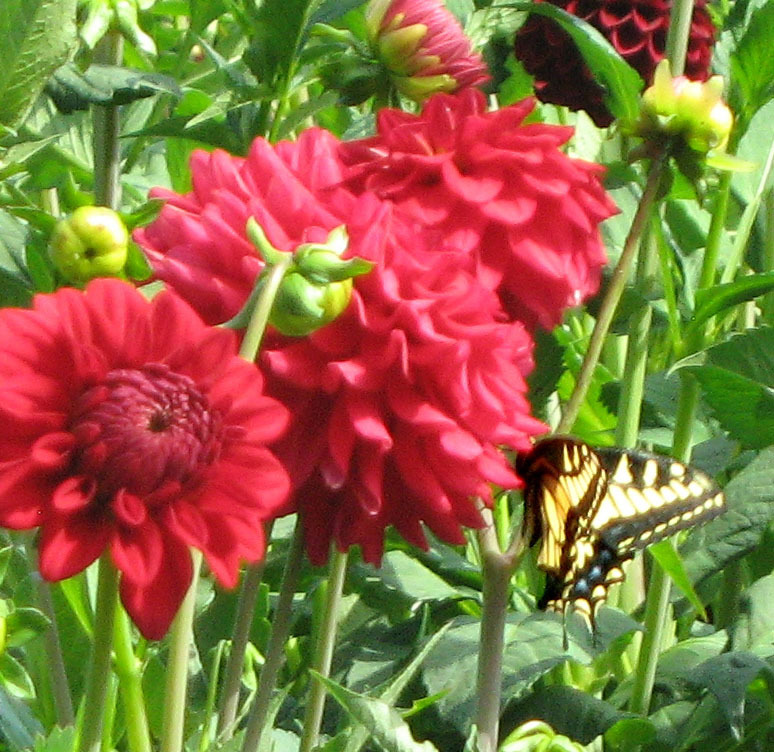 King Philip of Spain's botanist, Francisco Hernandez, sent to Mexico in the 1570s, recorded medicinal uses for the dahlia as well as its floral properties. of healing for early Aztecs. The tuber, he wrote, "alleviates stomach pain, dissipates blowing, draws forth urine, invokes perspiration, drives out coldness, strengthens the stomach weak because of the cold, turns aside cholic, opens what has been blocked, and when moved to the swellings, disperses them." 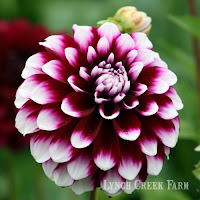 Observers of medical research report that long before insulin was discovered for treating diabetic patients, a particular type of sugar was processed from dahlia tubers, and used for such treatment. 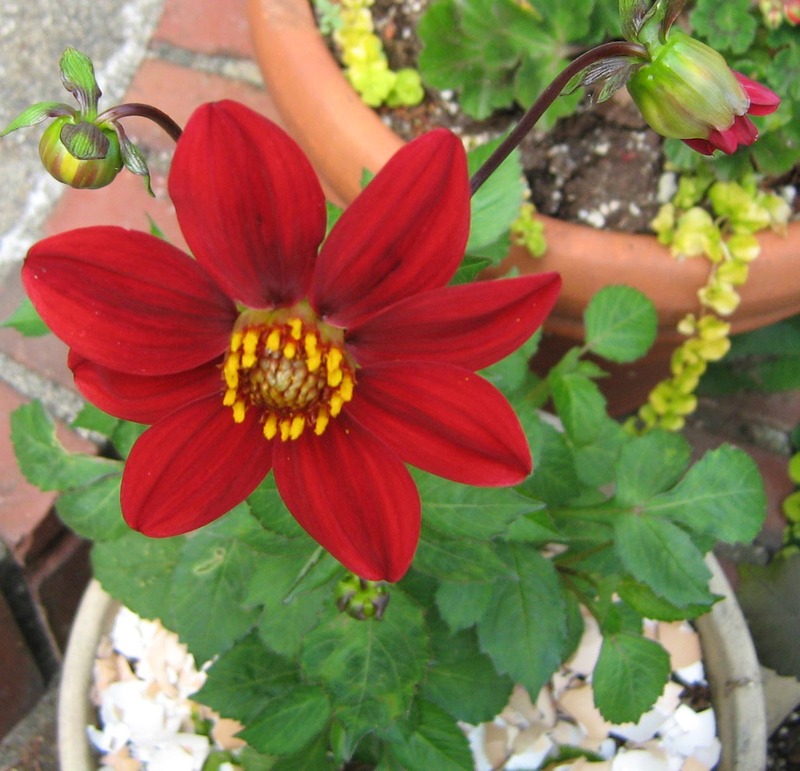 Today, medical research and studies have focused on the use of chemicals present in dahlias for liver and kidney issues. elegant wedding cake. Cooper Studios photo. While the dahlia tuber has fallen from favor as a vegetable, edible dahlia flowers are now finding favor among chefs and caterers, particularly caterers of summer weddings. 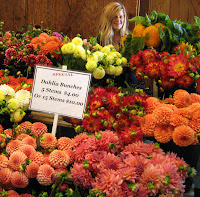 Dahlia flowers are used to enhance the flavor and visual appeal of foods from salads to desserts, from appetizer trays to wedding cakes and punches. The sharp, spicy tang of petals punches up the flavor of lettuces in a salad, and the whole flowers, whose substantial texture means they last well and whose wide range of colors lends itself to table decor, are often used to float in beverages and to decorate cakes. 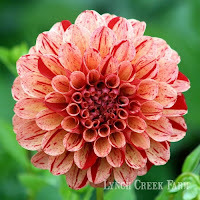 Your dahlia tubers, carefully dug and probably divided last fall after blooming splendidly in your gardens last summer, are enjoying their long winter's nap. 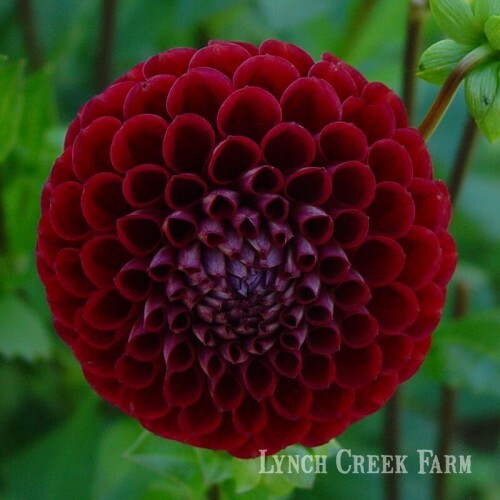 There's a host of such dahlia bulbs (sometimes referred to as dahlia roots, and correctly, dahlia tubers) at rest in the warehouse at Lynch Creek Farm. Right now, they're being sorted, checked over, and identified for packaging to await the shipping season. 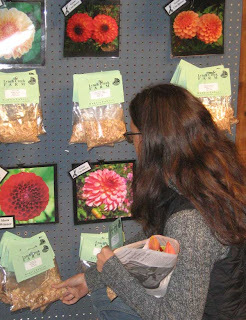 Things aren't altogether quiet in the dahlia department at the farm. 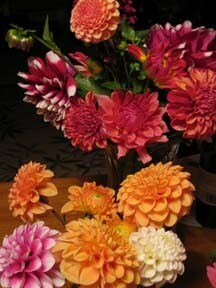 But at home this time of year, it's easy to forget about your dahlia tubers. How long since you've checked up on them? Made sure conditions are right for them? 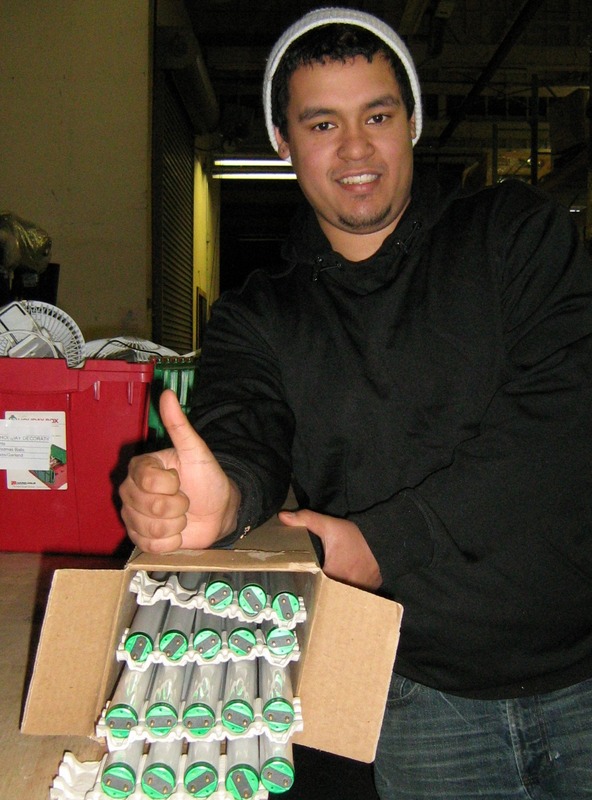 Storage temperatures should range between 40° and 50° Fahrenheit (4° to 10° Celsius). Humidity should be about 90 percent. It's essential that you inspect your tubers regularly to be certain they are weathering their winter storage well. If you haven't looked at them for a month or two, check up on them now. 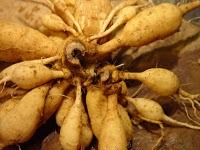 If the tubers have begun to shrivel, mist them with a fine spray of clean water or immerse them in a bucket of cool water for a few hours. Make sure they are completely dry outside before returning them to the storage medium you're using. Then occasionally mist the area lightly to increase the humidity. 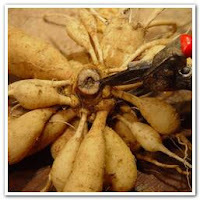 If, on the other hand, the tubers are limp or show signs of mold or rot, isolate them. Get rid of any that are soft; if there's only a small suspicious area, cut it away and keep the tuber isolated from the other, healthy ones. Decrease the temperature and humidity of your storage area. It may be necessary to use a pot of dessicant to reduce the humidity. If the area is too warm you may need to remove the tubers to a cooler area. 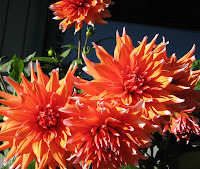 The whole point of taking care now is to have beautiful dahlias this summer. Want more flowers? Go to the Lynch Creek Farm website for a look at the beautiful options on sale now for shipping later when the weather's right. 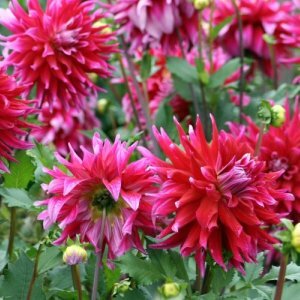 Want a chance at free dahlias? 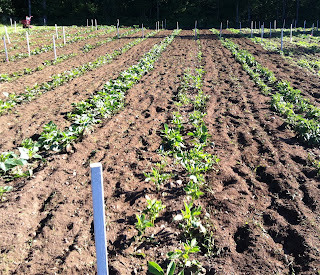 Visit the farm's Facebook page and "like" Lynch Creek Farm. 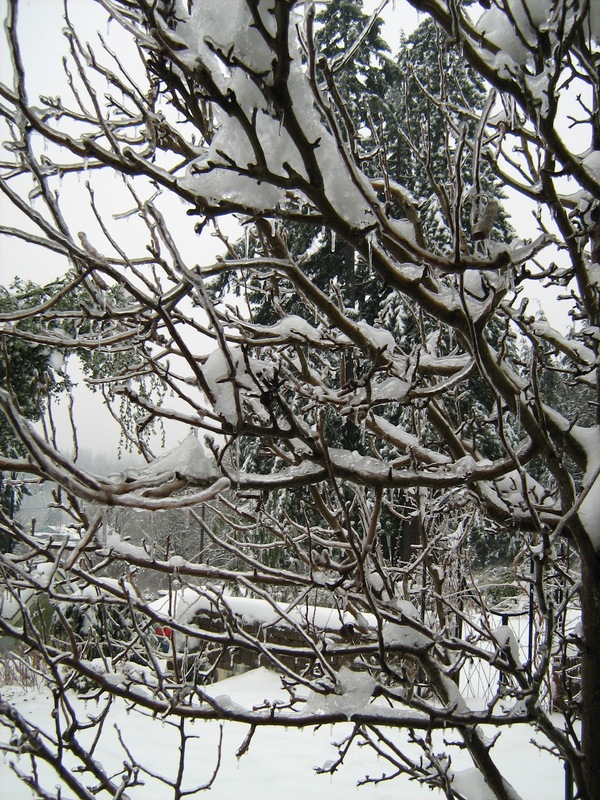 Winter hit the Pacific Northwest particularly hard in January. Western Washington, whose winters are usually mild, got slammed with floods, then heavy snow, then the first ice storm in 15 years. Ice storms are rare in Lynch Creek Farm's part of the world, and this one arrived on the heels of a heavy snowfall: one to two feet of snow (also rare here). The ice rain lasted for two days. 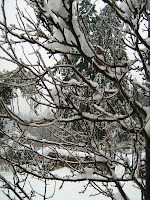 Tree limbs and whole trees toppled under the weight of the accumulated ice and snow. Naturally, the broken limbs and fallen trees took power lines out left and right. Some South Puget Sound residents and businesses were without power for as much as a week. But Lynch Creek Farm's dahlia tuber storage wasn't seriously affected; the power wasn't out long. 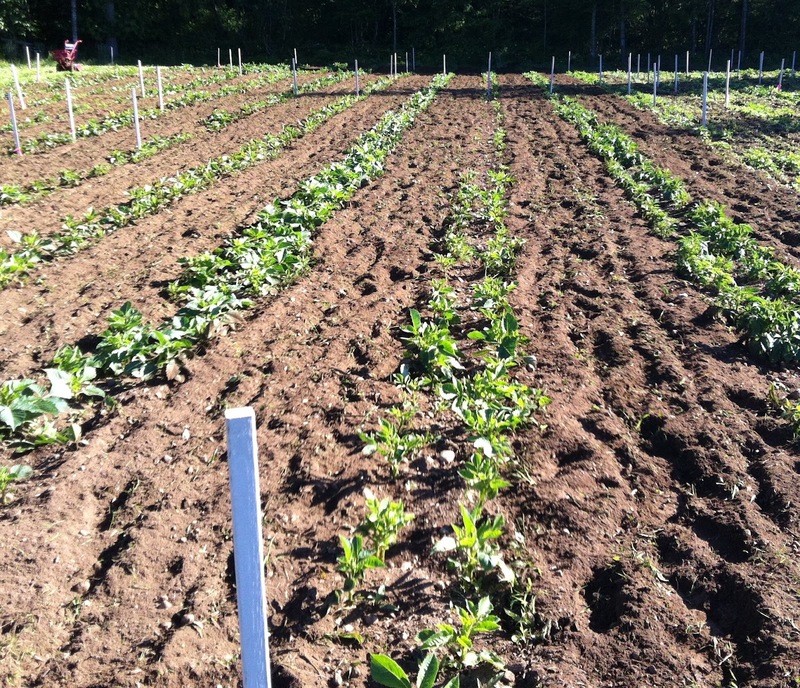 And since the ice storm came on a warming trend, the farm's dahlia tubers rested secure, insulated by cedar chips and peat moss. when dahlias bloom this summer. Although Punxsatawney Phil spotted his shadow last week, and there are weeks more of winter to get through, it's time to start looking forward to spring, to the planting of dahlia bulbs (actually, dahlia tubers) and the glorious array of summer dahlia flowers they'll produce. If the days are still a little long and dark, you can think spring by checking out Lynch Creek's displays of great dahlias — dinner-plate dahlias to little pompons, spiky cactus dahlias to tidy mignon singles — and reserve your first choices now.